I love chocolate chip cookies. I love peanut butter cookies and Christmas cookies too. If they are sugar free, that’t even better. As you know, I am trying to cut out sugar in a big way. I am not always very successful though. At Christmas, my family bought me chocolate covered mints for my stocking. Yes, I am eating them. And yes, they are almost gone. So, making sugar free or low sugar cookies and brownies is what I like to do to curb my sweet tooth. Last weekend, shopping with Jeffrey, we went to the CO-OP. It’s a small whole foods, natural almost everything grocery mart in the middle of a neighborhood. It’s placement is strange, but we like looking around at what they have and what changes we should make next. Looking in the baking section, we came across Big Tree Farms Organic Coconut Sugar. I have heard of it, but I knew nothing about it. So, I read that package and found that it is organic, non-gmo, certified fair trade, naturally nutrient-rich, has 4g of sugar per 1/2 tablespoon and low on the glycemic index. All great reasons to buy it. So we did. Last Sunday after church, when I wasn’t enjoying the sunny day in W. WA, I decided to make some chocolate chip cookies and use the coconut sugar. 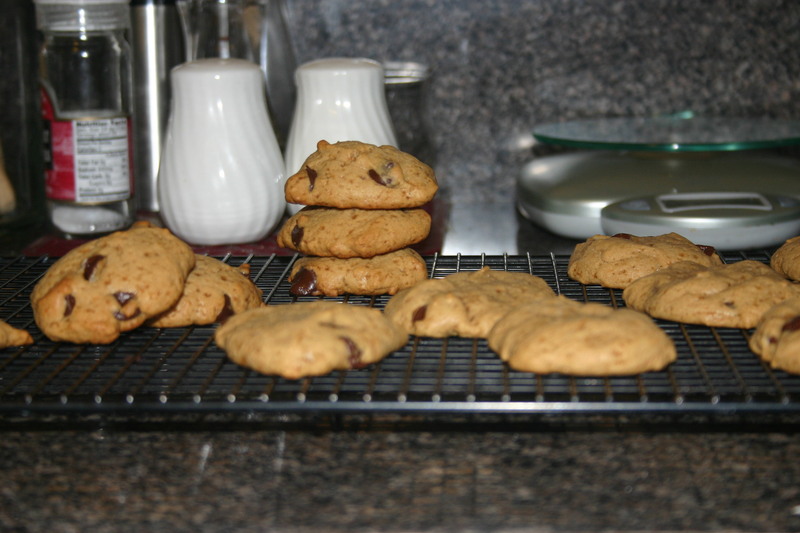 I found a recipe on my Pinterest Sweet Baking Obsession board for low sugar chocolate chip cookies. It’s a small recipe and I modified it for my liking, but you can find the original recipe on www.theskinnyonlowcal.org. 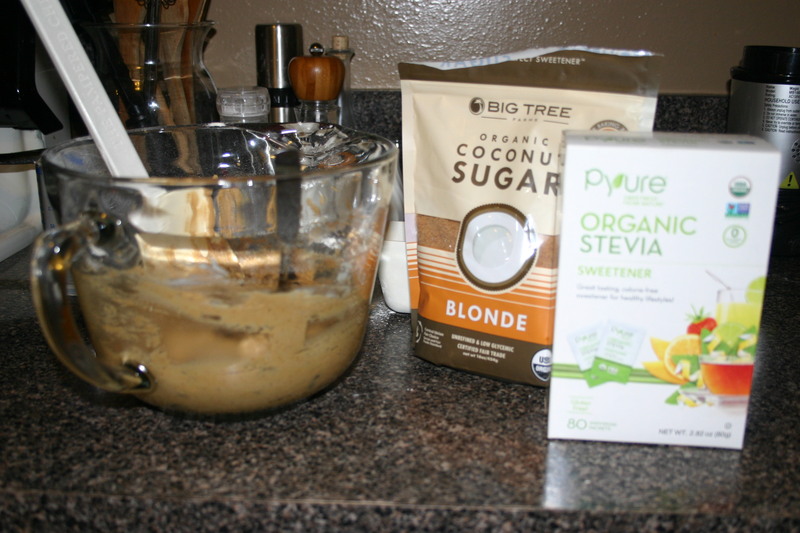 Preheat oven to 350 degrees F. Cream butter, coconut sugar, stevia, and vanilla together in a medium mixing bowl. Mix until well blended and creamy. Add eggs, one at a time, mixing well after each addition. Then add flour, baking soda and salt. Mix until well blended. Stir in chocolate chips. Place spoonfuls of cookie dough on a pre-heated baking stone. Bake 8 minutes for fluffy cookies, 7 minutes for gooey in the middle cookies. (Which is how I like them.) 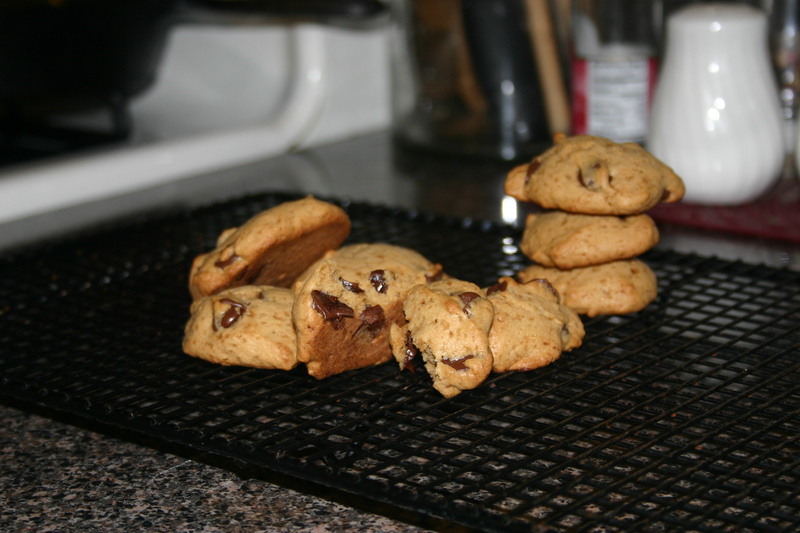 Remove from the oven, let them cool for 5 minutes, then move them to a wire cooling rack. The stacked are 8 minute cookies. The others are 7 minute cookies. Cookies do not last long in a house with teenagers, but I got 3 days out of these cookies. Which is actually pretty good.